Mankind has always been looking at ways to transport themselves and carry goods or their belongings. Initially the amount of goods that could be transported was restricted to how much a man could carry comfortably. Later humans harnessed the power of animals to assist. Horses and beasts of burden were some of the four legged friends utilised to pull carts and wagons over distances. It became obvious that reliance on horsepower had its limitations. Not least of which were the need to rest, feed and water the animals at various stages over a long journey. Stage coaches travelling, for example, from Manchester to London required a number of changes of horses at various stages (thus ‘stage coach’) along the route. The journey was long and uncomfortable. The solution appeared to be the invention of a horseless carriage. Initially pedal power proved to be useful in the form of bicycles. Trains provided reliable means of transport but the traveller was restricted to going only where the railway network could take them. A labour saving means of transport had to utilise an engine of some sort. This would offer more freedom of movement. A number of different forms of propulsion were utilised. 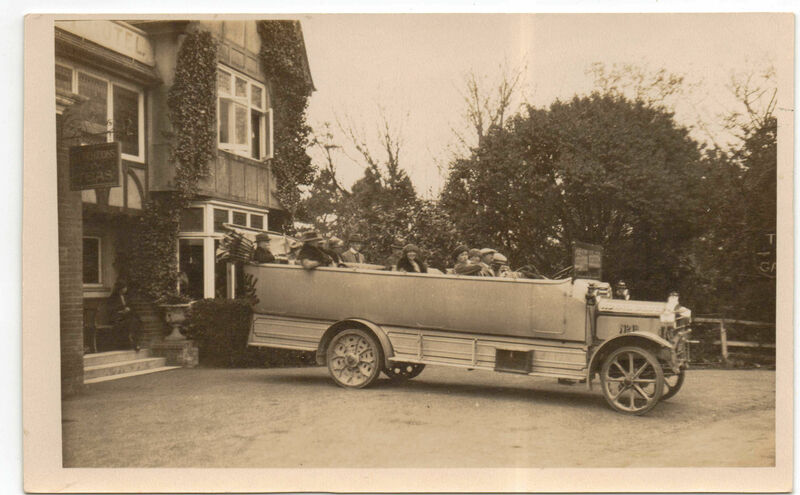 This image shows a steam car owned by Mr Dallas of Eastley, Wootton. This vehicle is an 1899 ‘Lifu’ which burned paraffin and water to create steam. It has a top speed of 12 mph. 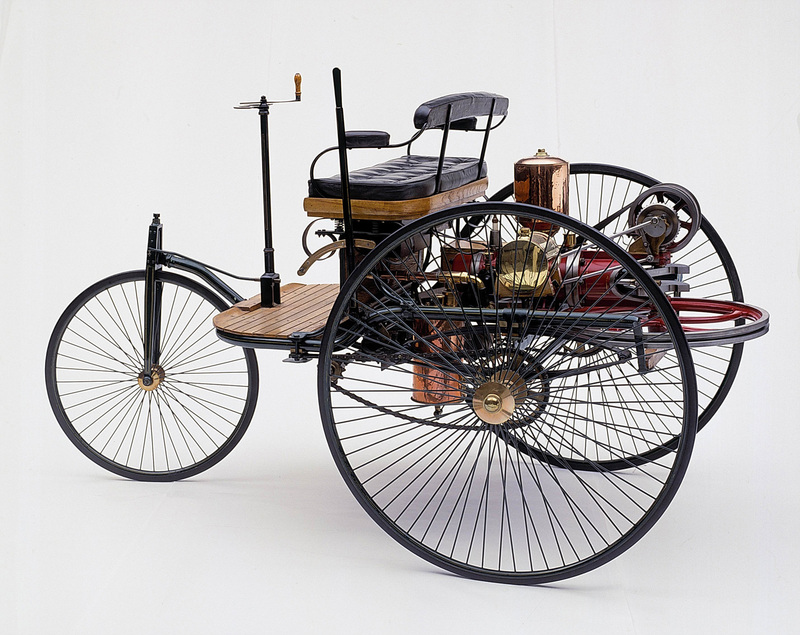 The first viable motorcar was invented by Carl Benz. In 1886 he patented a three wheeled ‘Motorwagen’. 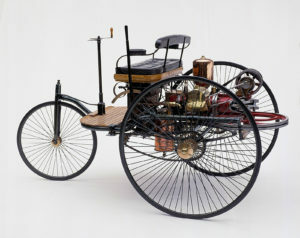 This was the first vehicle to be powered by a petrol engine. Ironically it was not until his wife, Bertha, drove the vehicle to see her mother some 60 miles away that the practical uses of a motor vehicle were recognised. One of the difficulties was cost. Initially only the wealthy could afford a motor vehicle. To evidence this one of the first owners of a motor car in Milton parish was Dr Hunter-Woods. He lived at ‘Essendene’ which was located at the junction of Station Road and Osborne Road. At this time the only other local motorcar owner was Colonel Clinton owner of the Ashley Clinton estate. This image is from a postcard dated 1915. It shows the Wheatsheaf and the George Inns. 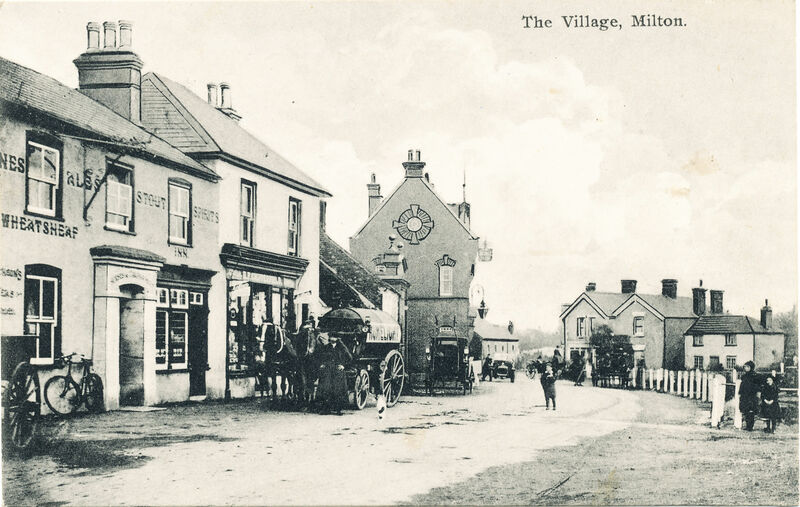 It is of interest as it shows a variety of different forms of transport in use in Milton village. There is a bicycle propped beside the door of the Wheatsheaf. A horse drawn wagon is delivering goods, possibly ‘Sunlight’ paraffin, to Mr Chipperfield’s grocery shop. A couple of horse drawn cabs or buggies can be seen, but in the background near the school, is a motorcar. Soon, garages started to appear in our town offering the sale, hire and repair of motor cars and motor bikes. 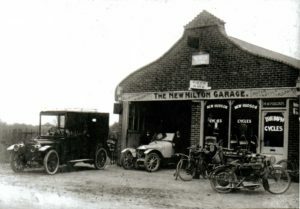 One example is the New Milton Garage, which was located opposite Fernhill Manor. The proprietor was a Mr Harry Fagan. 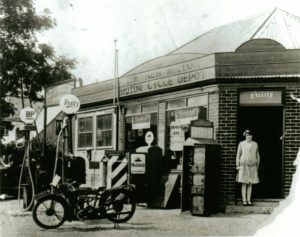 This business later became Coopers Garage which ceased trading in 1985. In the early history of motoring Great Britain always appeared to lag behind the fast pace of motor vehicle technology. Mass production of affordable transport was one example. When Henry Ford produced the Ford Model T in 1912 he did away with hand crafted methods of building vehicles. He introduced mass manufacturing. By the time production of this car stopped in 1927 some 16 million versions of the Model T had been made. This made ownership of a motorcar an affordable option for the average working American. In 1927 the Austin 7 became the British equivalent of the Model T. Although not produced in the same huge quantities as its American counterpart, this car made motoring economically viable for the average British family. For many lower paid people their only contact with motor vehicles was through their work. 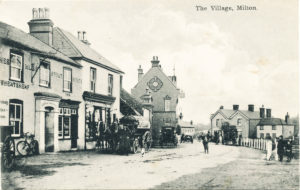 New Milton Urban District Council for example, used a steam engine to maintain the roads. 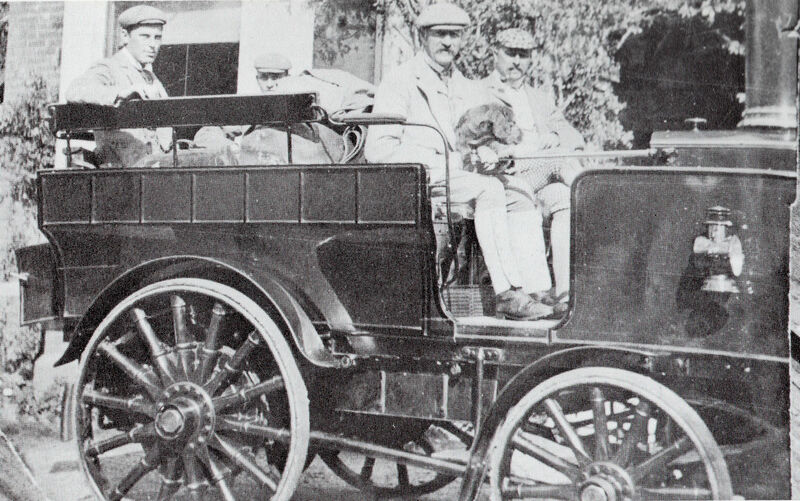 Some companies, in addition to using vehicles for work purposes also used them for leisure. 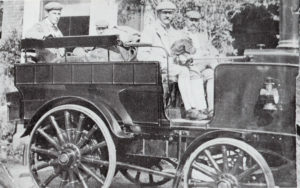 This image shows the 1922 char-a-banc outing of H Drew’s workmen to Salisbury. These day trips were a popular way of rewarding the work force. By the 1930s motor vehicle ownership was flourishing. There were a number of car dealerships in our town. 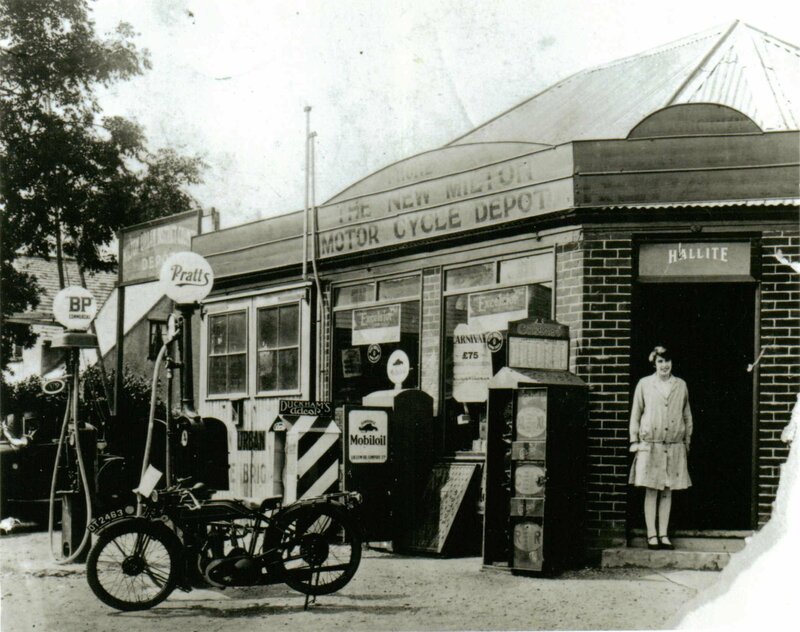 In addition to the New Milton garage there was the New Milton Motor cycle depot in Gore Road, Wall and Martins on the A337 and Fred Keepings garage located opposite the railway station. Car ownership and use took a dip in popularity during the war for obvious reasons. However wartime military service taught many men and women how to drive and maintain motor vehicles. The late 1940s and early 1950s saw a boom in the use of private motor transport. Today after 130 years of development the motor car is an essential part of everyday life. What will transport look like in another 130 years?